Some of the most famous names of the Sephardic community can be traced back to medieval times. Whereas most Ashkenazi surnames are of relatively recent origin, Spanish Jews have used family names since medieval times and are used by their descendants to this very day. Although Sephardi and Ashkenazi names are distinctly different, many times they mean the same thing. For instance, the Italian surname of Montefiore is identical in meaning to the German surname Bloomberg, both of which mean ‘mountain of flowers’. Prior to the 1492 expulsion Spain was a golden era for Jews. However, in 1492 King Ferdinand and Queen Isabella issued the Alhambra Decree ordering all Jews living in Spain to leave the country by July 31 – the day of Tisha B’Av. Many fled to Portugal as refugees but were forcibly converted only five years later. Those that left Spain or escaped from Portugal were widely dispersed throughout the Ottoman Empire, Italy and South-Eastern Europe where they either joined existing Jewish communities or established new ones. Salonica, Morocco, Izmir, Istanbul, Holland and The Island of Rhodes are only some of the places where thriving Sephardic communities were established. Many also fled to Gibraltar and North Africa because of its proximity to the Iberian Peninsula while others were able to flee to Israel or the New World. Most of the names listed below can be found among Inquisitional manuscripts, Church registrars, notarial archives and other ancestral records that go back for centuries in both the Spanish and Portuguese kingdoms. Sephardic surnames often denote places of origin and were directly related to geographical locations either before or after the expulsion in 1492 or were acquired during the forced wanderings caused by the exile. Toledano (Toledo), Soriano (Soria) and Romano (Rome) are just a few examples. Other Sephardic names such as Benzaquen, Ben-Ezra and Ohana were of Hebrew or Arabic derivation. Many family names were related to one’s profession such as Melamed, Cabrera and Alhadeff. Like their Ashkenazi brethren, surnames such as Cohen and Levy are also found among Sephardic communities and denoted Cohanic or Levitic descent. Some Jews that chose to convert and stay in Spain after the edict of expulsion took upon the names of the their Christian godparents but practiced their Judaism in secret until they were able to escape to nearby countries such as the Netherlands, England and France where they reconverted back to Judaism. Italian, Spanish, French and Latin words are commonly found among most Sephardic surnames as many of the provinces and cities in the Iberian Peninsula derived their names from these languages. 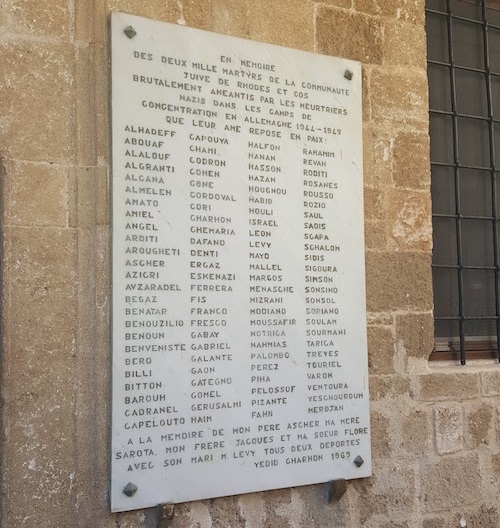 Plaque commemorating families murdered by Nazis in Rhodes. Here’s a list of some of the most famous names of the Sephardic community. Abarbanel: From the Hebrew word ‘Av’ meaning ‘father’ , ‘Rabban’meaning ‘priest’ and ‘El‘ meaning ‘God’. One of the oldest Spanish family names which traces its origin from King David. Abecassis: From the word ‘Av’ meaning Father and Arabic ‘kassas’meaning storyteller. In Algeria, community leaders and rabbis were given the title ‘Kassis’. Many Jews from Gibraltar, Portugal and Morocco share this name. Adatto: From the Italian word meaning ‘suitable’ or ‘appropriate’. Jews that left Spain for Turkey via Italy took on this name. Alhadeff: The name means “weaver” and is of Spanish/Moorish origin found most often among Jews who left Spain after the expulsion for the Greek Island of Rhodes. Alkana: Meaning ‘God bought’ in Hebrew. Almo/Almosimo: From Spanish meaning ‘One who gives to the poor’. Amiel: From the Hebrew words ‘Am‘ (nation) and ‘El‘ (God) meaning ‘God’s people’ or ‘the people of God’. Angel: The surname comes from the Hebrew word of ‘malach’meaning ‘angel’. The Angel family traces back to medieval Spain and migrated to Greece and the Island of Rhodes. Ashkenazi/Eshkenazi: Ashkenazi meaning ‘German’. The Sephardic carriers of the surname would have some Ashkenazi ancestors who moved to Sephardi countries and joined and were adopted by those communities. Azose: Anglicized version of the surname ‘Azuz’. The root of the name comes from the Hebrew word for strength – ‘Oz‘. Behar: Many origins of the Behar surname. From the Hebrew ‘behor’meaning ‘eldest’ and the Turkish word, ‘Bahar’, meaning Spring. Also from Spanish ‘abeja’ meaning bee. Behar is of pre-roman origin and is also the name of a town in the Spanish province of Salamanca and was probably a habitational name for many Jews of that province. Many Sephardic Jews from Bulgaria and Greece carry this surname. Benarouch: A patronymic name meaning ‘son of the head (leader)’ in Hebrew. BenPorat: A patronymic name meaning ‘son of the prosperous’ in Hebrew. Benezra: A patronymic name meaning ‘son of the helper’ in Hebrew and a popular name among Spanish Jews. There is a tradition that this family name is of priestly (Cohen) lineage. Benaroya: From “Ben” meaning son and “Arroyo” meaning rivulet or river in Spanish. Banaroya is a variant of BenArroyo or BenArollia. Benveniste: From the Latin ‘veniste’ meaning ‘you came’ and ‘ben’ meaning ‘son’ in Hebrew. This was a widespread Sephardic family originating in Spain that dispersed throughout the Ottoman Empire following the expulsion. Benzaquen: Patronymic name meaning ‘son of the elder’ in Hebrew. Cabrera: From the Catalan-Spanish meaning ‘goat herd’. Calvo: The name Calvo comes from the Latin ‘calvus’ meaning ‘bald-headed man’ and has its own coat-of-arms. The Calvo family originated from Galicia Spain. Carvalho: common Sephardic surname from the Portuguese word meaning ‘oak’. Cardoza: Habitational name from Cordoza, Spain. Coronel: From the Portuguese word meaning ‘colonel’ or ‘officer’ and also possibly from the Portuguese ‘caro’ meaning ‘dear”. The family name originally comes from Galicia, Spain and has its own coat-of-arms. Franco: A variant of the Latin ‘Francis’ meaning ‘free one’ or ‘Frenchman’. A common surname in the Iberian Peninsula adopted by Jewish families and a reference to the Germanic Franks who invaded modern day France during the first millennium AD. Gabay: From the Hebrew word meaning ‘warden’ (of a synagogue). This title referred to a variety of roles, but most were related to the collection of taxes, fees and other payments from Jews. Galante: From the French word ‘galant’ meaning chivalrous or noble. The Galante family was of Portuguese/Italian descent which flourished in Rome during the 16th century. Halfon: Hebrew word for moneychanger. Harari: Hebrew for ‘mountaineer’. The Harari family originated from the city of Montpellier in Southern France. Hassan: From the Hebrew word meaning ‘cantor’, also possibly from the Arabic hassan meaning ‘handsome’. A rabbinical family that originated from Spain and settled in Morocco and Italy following the expulsion from Spain. Laniado: Meaning ‘hairy’ in medieval Spanish. Leon: From the region of Leon which was part of the ancient Spanish Kingdom of Castile-Leon. Luzatto: An Italian family descended from a Jew who immigrated to Italy from the province of Lusatia, Germany. Maimon: From Arabic/Hebrew meaning ‘fortunate’ or ‘lucky’. A prominent rabbinical family from Spain. Maimonides was known as ‘Moses ben Maimon’. Mansour: From Arabic meaning ‘Winner’ or ‘victorious one’. Also from the Egyptian city of Mansura in the Nile Delta. Marcus/Marciano: From the Latin ‘Marculus’ meaning ‘hammer’. An Italian name picked up by Sephardic Jews after the expulsion. Melamed: Meaning ‘teacher’ in Hebrew. Mitrani: Habitational name from Hebrew meaning ‘from Trani’. From the seaport town of Trani in Southern Italy. Mizrachi: Meaning ‘Oriental’ or ‘Easterner’ in Hebrew. Montefiore: From Italian ‘monte’ meaning ‘mountain’, and ‘fiore’meaning ‘flower’. This surname belonged to Sephardic Jews who originated from Italy. Naor: Meaning ‘enlightened’ in Hebrew. Nissim: From the Hebrew word meaning ‘miracles’. Ohana: A derivative of the Hebrew name ‘Hannah’ meaning ‘gracious’ or ‘favor’. Jews with this name established themselves in Morocco and Northern Africa following the expulsion. Ovadia: Meaning ‘God’s servant’ in Hebrew. Pinto: From the Spanish word meaning ‘chick’. Pinto is also a province in Spain near Madrid and was most likely a name derived from the Jews that lived in this province. Russo: From the Latin ‘russos’ meaning ‘red’. Most people with this surname and its variants have their roots in either Spain or Italy. (Ben)Quaknine: A patronymic name meaning ‘son of Jacob’. In Berber, the diminutive name of Jacob is ‘Aqnin’. The name and variants are recorded in 13th century Spain and Morocco. Sasson: Meaning ‘joy’ or ‘merriment’. Found among Jews that trace their ancestry to Toledo, Spain that moved to Turkey after the expulsion. Serfaty: Means ‘Frenchman’ in Hebrew. An Oriental family that traces its line to France and are likely descendant from Rashi. Serrano: From the French word ‘serre’ meaning ridge or Spanish ‘serra’ meaning ‘mountain range’ in Portuguese and Catalan. Silvera: Habitational family name from the Spanish town of Silva in Galicia, Spain. The name is derived from the Latin ‘silver’ meaning ‘wood’ or ‘forest’. Members of this family migrated to Italy after the expulsion. Soriano: Habitational name from Soria (Castile/Leon) in northern Spain. Jews with this name established themselves in both Italy and Rhodes following the expulsion. Spinoza: From the Italian ‘spinoso’ meaning ‘thorny’ and the Spanish ‘espinoso’, also ‘thorny’. The family name came be found among Jews that came from Portugal and Galicia, Spain. Toledano: From Toledo, a province of Spain. Many families of Sephardic rabbis originated in Toledo. After the expulsion from Spain they were immigrated to Safed, Greece, Morocco, and later in Holland, England, and Turkey. Varon: from the Latin word for man. In Spanish, ‘Varon’ means ‘man’ or ‘male’. Also possibly a habitational name for several places in Castille and Galicia with this name. Vidal: Meaning ‘alive’ or ‘life’ in Latin (vita). As taken from, http://www.aish.com/jw/s/The-Meaning-of-Some-Common-Sephardic-Last-Names.html?s=show on August 6, 2017.